“Belly dancer's dyskinesia” or diaphragmatic flutter is a rare movement disorder characterized by rhythmic, involuntary contractions of the diaphragm resulting in undulating, rhythmic movements of the abdomen resembling a belly dance. Though it has been shown to result from a variety of central and peripheral causes, most cases are idiopathic in nature.,,, The diagnosis is always clinical and can be supported by the fluoroscopy and diaphragmatic electromyogram (EMG) showing rhythmic contractions of the diaphragm.,, The diagnosis of this condition is often delayed due to its rarity. Here we describe a rare case of belly dancer's dyskinesia. A 12-year old boy presented with rhythmic, continuous, movements of the abdominal wall without any other symptoms for the last two weeks. These movements started after 10 days of a diarrheal illness and gradually increased in intensity over two days. There was no history of pain, fever, dyspnoea or any drug intake. These movements were equally present in all positions of the torso and were absent during sleep. Examination showed rhythmic, undulating, movements of the abdomen and lower trunk [Video 1]. 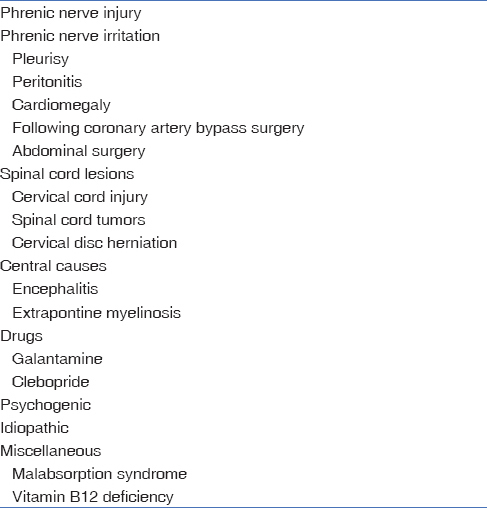 Rest of the general and neurological examinations were normal. Blood investigations, including the complete blood count, erythrocyte sedimentation rate (ESR), renal, liver and thyroid functions tests, serum calcium, antinuclear antibodies (ANA), and antithyorid antibodies were normal. Echocardiography was normal and heart contractions were distinct from the movements. Similarly, the magnetic resonance imaging (MRI) of the brain and cervical spine, abdominal sonography and computed tomographic (CT) scan of the chest were normal. Fluoroscopy confirmed that these movements were of diaphragmatic origin involving both hemidiaphragms [Video 2]. He was treated with phenytoin, valproate and clonazepam without any benefit. In view of the preceding diarrheal illness, we also considered an immune basis for these movements. However, a five-day course of methylprednisolone did not produce any benefit. Belly dancer's dyskinesia is a rare movement disorder, largely of idiopathic origin. It was first described by Antonie van Leeuwenhoek in 1723 when he himself experienced the symptoms. Since then, various names have been proposed for this disorder including Leeuwenhoek's disease, diaphragmatic myoclonus, diaphragmatic tremor, diaphragmatic flutter, moving umbilicus dyskinesia, abdominal myoclonus, and respiratory myoclonus. It is a form of segmental myoclonus, similar to the better known syndrome of palatal myoclonus. It can present with transient and recurrent episodes of diaphragmatic flutter or can occur continuously, as was seen in our patient. Patients with episodic diaphragmatic flutter may present with abdominal and chest pain, recurrent palpitations, dyspnoea, and episodic abdominal wall movements. In its episodic form, it can be confused with cardiac arrhythmias, myocardial infarction, acute abdominal and respiratory conditions, and hyperventilation syndromes.,, The other condition with which diaphragmatic myoclonus may be confused is propriospinal myoclonus. However, propriospinal myoclonus has irregular, flexor jerks involving axial muscles of trunk, hips and knee joints which are more prominent in the supine position. Polymyographic studies in propriospinal myoclonus show typical features in the form of fixed pattern of muscle activation, synchronous activation of agonist and antagonist muscles, and EMG burst duration of less than 1,000 ms. In contrast, diaphragmatic myoclonus presents with rhythmic, undulating movements involving the abdominal wall and intercostal muscles. The diagnosis of diaphragmatic flutter can be confirmed with fluoroscopy and diaphragmatic EMG, which show rhythmic contractions of the diaphragm. Diaphragmatic flutter has been described in all populations and at all ages ranging from 4 months to 93 years., After a review of 42 cases, Rigatto and De Medeiros reported that the rate of diaphragmatic contractions varies from 35-480 per minute with an average rate of 150 per minute. These high rate diaphragmatic contractions are superimposed on the normal respiratory pattern and these contractions usually occur both during the inspiration and expiration. This syndrome has been described with various secondary causes [Table 1].,, The generator source for diaphragmatic flutter is believed to be in relation to the respiratory centres in rostral medulla. In addition to fluoroscopy and diaphragmatic EMG, abdominal ultrasound can also be used for the confirmation of diagnosis. Different treatments have been shown to be effective including phenytoin, carbamazepine, diazepam, clonazepam, haloperidol, and phrenic nerve block/crushing in resistant cases. Prognosis is variable in which some cases resolve spontaneously or with treatment while many cases persist for years. Iliceto G, Thompson PD, Day BL, Rothwell JC, Lees AJ, Marsden CD. Diaphragmatic flutter, the moving umbilicus syndrome, and “belly dancer's” dyskinesia. Mov Disord 1990;5:15-22. Rigatto M, De Medeiros NP. Diaphragmatic flutter: Report of a case and review of the literature. Am J Med 1962;32:103-9. Patterson V. Belly dancer's syndrome: Causes, clinical presentations, and treatment. Available from: http://www.logan.edu/mm/files/LRC/Senior-Research/2011-Dec-31.pdf. [Last accaessed on 2017 Jun 08]. Ramírez JD, Gonzales M, Hoyos JA, Grisales L. Diaphragmatic flutter: A case report and literature review. Neurología 2015;30:249-51. Chen R, Remtulla H, Bolton CF. Electrophysiological study of diaphragmatic myoclonus. J Neurol Neurosurg Psychiatry 1995;58:480-3. Larner AJ. Antony van Leeuwenhoek and the description of diaphragmatic flutter (respiratory myoclonus). Mov Disord 2005;20:917-8. Maramattom BV, Sreekumar P, Kumar RA. Diaphragmatic flutter masquerading as palpitations. Ann Indian Acad Neurol. 2016;19:402-3.